There has been some debate amongst the British and American Left about the nature of the challenges to the old political establishment offered by Brexiters and Trump (‘Brexit plus, plus, plus’). Some have argued that these represent fightbacks. by the working class against the neoliberalism, albeit somewhat distorted. This blog has posted several articles which have argued that these Right populist challenges have been mounted by sections of the ruling class, not so openly compromised by the 2008 crash, in order to win wider ruling class support and launch a stepped up ruling class offensive. They have indeed successfully made appeals to sections of the working class, but mainly those who have lost their traditional organisations and self-confidence and are looking instead for saviours. The recent triumph of the Right in Austria shows this process going one step further. This has happened shortly after some other liberal and Left commentators argued that the recent defeat of the far right Freedom Party’s presidential candidate in Austria, and the electoral victories over Geert Wilders and Marine Le Pen show that right populism is being contained in Western Europe at least. 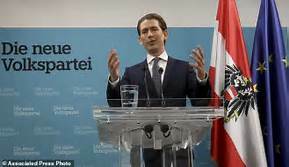 However, a section of Austria’s leading traditional conservative People’s Party, led by Sebastian Kurz, decided it would break the longstanding Peoples Party/Social Democrat Party coalition and push politics to the Right. Kurz successfully captured the Peoples Party leadership. After the recent general general election he led the party into a new government coalition, this time with the Freedom Party. Far from undermining neo-liberalism, Kurz intends to use this coalition to mount a stepped up neo-liberal offensive. This is also the trajectory of the real leaders of the Brexit and of Trump and his backers. This article by Benjamin Opratko describes what has happened in Austria.